Canadian company Kinectrics has been awarded two major contracts by Romania’s Societatea Nationala Nuclearelectrica, the owner/operator of the Cernavoda nuclear plant. Romania’s Cernavoda 1&2 comprises two 650MWe Candu 6 reactors, which began operating in 1996 and 2007. They supply almost 20% of Romania's electricity. 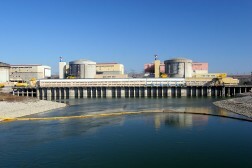 Two further similar Candu reactors are planned for the site. The contracts were awarded to Kinectrics Nuclear Romania, a subsidiary of Kinetrics International. The first contract is for the preparation of the second Periodic Safety Review (PSR) for Cernavoda 1 and the first PSR for Cernavoda 2. Work will involve the preparation of two PSR Basis Documents, one for each unit. A total of 22 Safety Factor reports will be produced, eight for each unit and six that are common to both. Finally, for each unit, a Global Assessment Report and a related database will be prepared. The contract value is more than €7 million ($7.9m) for completion by April 2022. The second contract concerns the update of the Fire Hazard Analysis (FHA) for Cernavoda 1&2. This involves the update of the existing FHA to account for all addenda and implemented modifications since the last FHA was completed and to assess and propose solutions to all findings within the Control Verification Reports recorded by the Emergency Inspectorate (ISU) and regulatory body (CNCAN). Kinectrics will lead this project with technical assistance provided by the Sigura Group, a specialist Romanian fire protection company. The project duration is seven month, and the contract value is RON390,000 ($97,400). Toronto-based Kinetrics also announced on 14 March that it had won “a large multi-disciplined engineering services contract totalling several million dollars” for the Bruce Power Lifetime Asset Management Programme (LAMP). Bruce Power’s life extension programme is now its fourth year, remains on time and budget. Major Component Replacements (MCRs) are scheduled for Bruce units 3-8, which will enable the Bruce A and B plants to operate until 2064. Bruce A 1&2 have already been refurbished. The MCR will begin in unit 6 in 2020, followed by units 3 to 8.